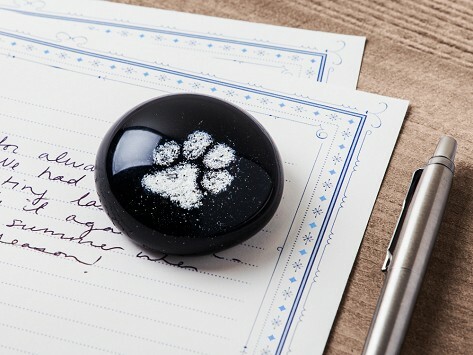 The spirit of a pet who has passed away lives on in a cremation glass paperweight. Artist Tari Zarka’s unique designs are made with an animal’s ashes. She places the ashes—individually—into durable, borosilicate glass as it’s being crafted into a round paperweight. The result is a beautifully-made and meaningful memento that celebrates the life of a beloved companion. Made in the USA and Made for a Lifetime. Please note: Made of glass, do not drop. Adding ashes to glass may cause some bubbles to form in the final product. Keep out of reach of children.